Jordan grew up in Monmouth County, NJ He is a graduate of the University of Florida. He is in his final year at the Pennsylvania College of Optometry. 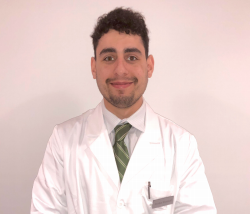 He has completed rotations at the Braverman Eye Center in Hollywood FL, The Eye Institute in Philadelphia, PA, the Jesse Brown VA in Chicago, IL and the Jamaica Plains VA in Boston, MA. Please extend a warm welcome for Jordan.